Georgina, -May, 21-2016, Roches Point, On, May, 31, -De La Salle beach, on Victoria Weekend. 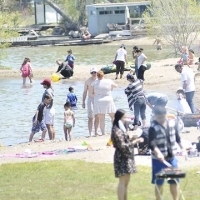 A comprehensive review of the town's major waterfront parks and beaches was floated after a verbal update at council last week regarding various issues piling up with the people flocking to play in Georgina on summer weekends. 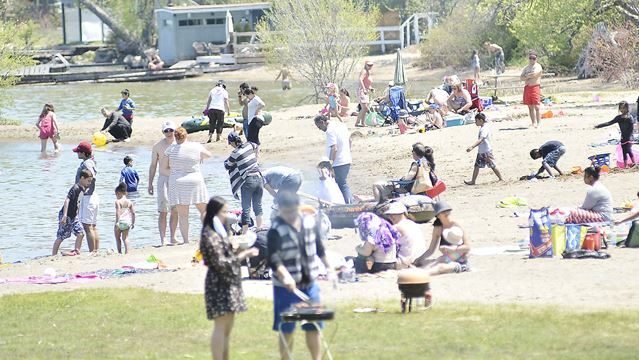 The verbal report confirmed what area residents have complained about for years — people, garbage, traffic issues and bylaw infractions are all piling up on Georgina's waterfront parks and beaches, especially with good weather and on long weekends. Despite the town's investment in underground garbage containers and a "regimented program" of washroom and park checks every half hour on weekends, operations director Dan Pisani confirmed "garbage is still an issue" at the town's main beach parks, including De La Salle, Willow Beach, North Gwillimbury and Holmes Point. Ward 5 Councillor Dave Harding suggested the cleanliness of the portable toilets at Holmes Point Park in Pefferlaw may also be an issue, based on the number of complaints he's received from area residents. Parking infractions also remain the No. 1 area of concern for the town's bylaw department during weekend patrols. It has issued 1,395 parking tickets to date for infractions in the main waterfront areas, as well as side streets that become beachgoers' parking avenue of choice with main parking lots usually packed to capacity by 1 p.m. While stalled traffic on Metro Road from vehicles lined up at De La Salle remains a problem, bylaw officers are not allowed to direct traffic due to liability issues. Assistance via paid York Regional Police duty officers has alleviated part of the problem, but not eliminated it. Acknowledging that parks and recreation and bylaw staff do "the best they can with available resources," Ward 3 Councillor Dave Neeson suggested a comprehensive review of how the town manages its beaches and waterfront parks is necessary as opposed to "piecemeal solutions" given the consistent concerns raised over their state during the summer. That would most likely fall under a proposed waterfront study already floated by council as part of discussions over the town's overall economic development and strategy moving forward. While revenue from the town's park facilities has already surpassed budget expectations, according to recreation and culture director Robin McDougall, she added the opening of the Hwy. 404 extension has presented increased challenges with the influx of people to the areas on weekends.